There aren’t many mass market brands that carry complete meals that are certified gluten free and vegan, but Cook Simple comes pretty close. They offer several meal starters that only require a diced canned of tomatoes and a little oil, such as the tibetan dal, which makes whipping up a satisfying dinner really easy. 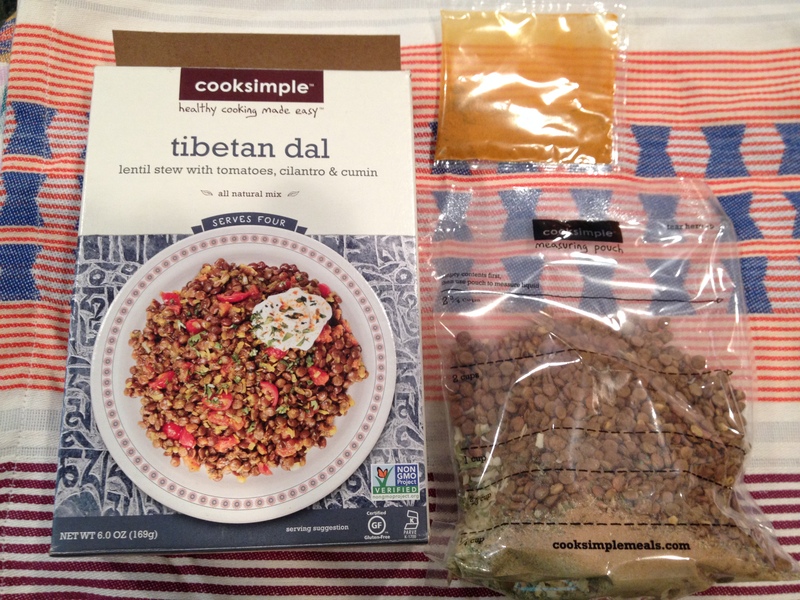 I’ve had a box of tibetan dal, a lentil stew, in my pantry for a while now waiting for a good time to try it. That turned out to be for lunch the other day. Full disclosure, after I started toasting the spices and cooking the lentil mix, I realized I didn’t have a can of diced tomatoes. The one ingredient I actually needed. So, I did what I do best and improvised with what I did have. The instructions for how to prepare the dal are clearly posted with pictures on the back of the box. The first step is to heat up the spices in the small packet with a little oil in a small pan. While that’s heating, your supposed to bring the lentils to a water with the necessary amount of water in a large soup pot. The bag the lentil mix comes in actually has a line of that you can use as a measuring instrument for the right amount of water, which is very convenient. I followed the directions up to this point. 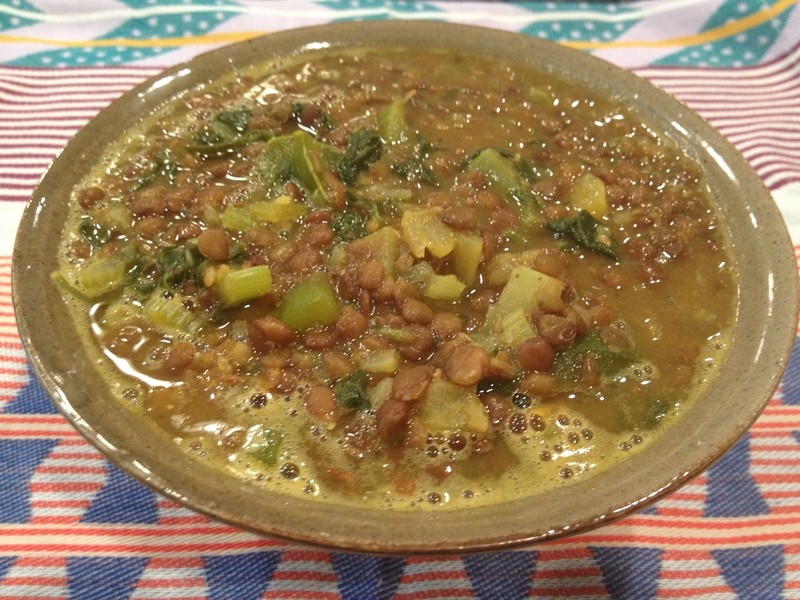 However, since I didn’t have the canned tomatoes, I added chopped celery, green pepper, parsley, spinach and a few yellow tomatoes with to the soup pot to cook along with the lentil mix. It takes about 10 minutes to cook, according to the directions, and I followed that pretty closely. Then your supposed to add the tomatoes and spices, but I just added the spices. I simmered it for another 5-10 minutes before serving it to myself. Despite my recipe variation, the stew was still quite tasty. The flavor followed a nice line between being spicy and too spicy. The box says it makes four servings, but it turned out to be two lunches for me. I would recommend this product. I do think, however, the addition of the fresh veggies added crunch and flavor to the boxed meal. Otherwise it would have only been lentils, tomatoes, dehydrated onion and garlic, and the spices. Since I love cooking with color, my variation gave it that. In the future, I’ll update this post with a review of making it exactly like the directions say. I’m also looking forward to trying other products from this brand.